I was at my wit's end. Seriously. Being the Mother of an 8 year-old-going-on-eighteen daughter, I spend most of my days stressed out. I had to stop the madness, and this is how I did it I just had to make a couple easy printables and set up an area for contemplation with a kids bean bag chair for potentially long time outs. So let me give you a little background. My daughter is actually a very sweet, loving, generous, intelligent, adorable person. When she wants to be. When she decides that the cutie pie I enjoy is going to be replaced by a willful, stubborn, disrespectful know-it-all, it's rough seas ahead. Now, I know there are kids out there that have obstacles that they cannot help, such as ADD, or are somewhere on the spectrum of autism or sensory deficits. These children require extra TLC and patience, but I'm sure that my idea (to follow below) would perhaps be helpful in the appropriate situations (a call to be made by the parents who know their kids so well!). My little precious does not struggle with such obstacles. She is an average kid growing up and trying to figure out her boundaries and how far to take Mommy until she breaks. So here's a typical scene, which occurs at least once a day... I ask her to do something. She ignores me. I ask her again, and she barely looks up saying she will do it. Then proceeds to NOT do it. I admit I have a short fuse when it comes to disrespect, thanks to my Mother who did not put up with it for a second. So, of course, my fuse is lit, and I blow up. "Did you hear me?! Get up right now and do what I told you to do NOW before I punish you!" I'm sure you know what happens then. She abruptly gets up, stomps around with an "I hate you" look on her face, and does the requested chore by banging around and causing a raucus. Nice. This could be something as little as opening the back door to let the dogs out which takes 30 seconds. Or, heavan forbid I ask her to help me cook or clean! So, right about now you're thinking my kid is bad. But, let's be honest, isn't this the norm right around 8-10 years old? It was clear that yelling was not working in a positive way. I got her to do the chore, but not voluntarily and by losing my temper, I ended up feeling guilty and super stressed out. But that's the only way I could get her to do anything when she didn't feel like helping me...this is what I told myself. The other day, I was on Pinterest looking for parenting tips. 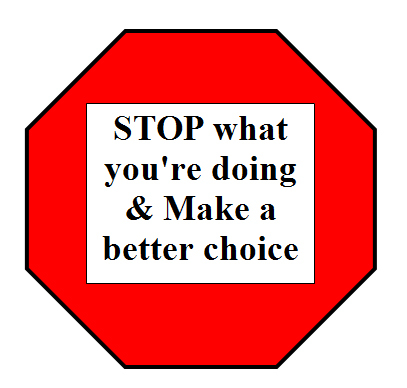 I found something simple but elegant: a stop sign cut out of paper and on it you write "Stop what you're doing & make a better choice." Incredible. To me, that is a constructive and positive message. It gives your child something to think about. Something to take responsibility for. What does SHE think is a better choice? YES! So I made this Stop Sign gem on regular paper and put tape on both sides as a DIY lamination so I could use it over and over. You can go as fancy as you like. When she angers me, I give her the Stop Sign and she has to hang out in her Ahh Products bean bag chair and contemplate what choice she is going to make. The bean bag positively adds to the decision-making process since she can comfortably hang out for a long time, and sometimes it takes quite a while for her to decide what choice she wants to make! I also provide a notepad and pencil for her to express herself if she finds it hard to verbalize an apology or explanation. Yes, I still get some stomping and sour-puss, but that all happens in her room so what I don't see or hear doesn't frustrate me. The last time I had to give out the Stop Sign, it took 40 minutes for her to settle down, and I was pleasantly surprised with a note where she apologized and explained what she did wrong and why she was sorry! *You can print out this Stop Sign! I created 20 at-a-boy tickets, with the 20th one being a special treat. Every time I hand her the Stop Sign, and she makes a good choice, I give her one of these tickets. They are numbered, so when she gets to the last one, she gets something from a treat jar. I wrote rewards on slips of paper and put them in a jar for her to choose from. That jar sits on the kitchen counter as a reminder that good things come to those who listen and cooperate. You don't have to make 20 tickets if you want to reach the reward faster - I just didn't want it to be too easy... so she hopefully gets used to being "good" without expecting a reward constantly. *Print out these tickets and cut them out! Ideas for treats: Pick something from the dollar store, choose what's for breakfast/lunch/dinner, go to the park, go ice skating, eat dessert first, bake cookies, play outside with Mom/Dad (that's a hard one, but it's quality time! ), play a game with Mom/Dad, a big kiss, a big hug. Let me know how this works for you! So far, it's only been a week, but I scream much less and am getting way more cooperation. Keep in mind that your child should be at an age and maturity where she can "make a better choice", perhaps with a little help from you. I'd say at least 6 or 7 years old. Do you have any tricks to parenting? I'd love to hear them!